The Next Einstein Forum (NEF), an initiative of the African Institute for Mathematical Sciences (AIMS) in partnership with Robert Bosch Stiftung celebrates NEF Africa Science Week 2018 in Nigeria in 35 African countries: Nigeria Zambia, Sudan, Benin, Angola, Uganda, Ghana, Guinea Bissau, Malawi, Swaziland, The Gambia, Zimbabwe, South Africa, Lesotho, Tanzania, Burundi, Sierra Leone, Burkina Faso, Somalia, Rwanda, Ivory Coast, Cape Verde, Republic of Congo, Mali, Togo, Ethiopia, Morocco, Namibia, Kenya, Guinea, Cameroon, Niger, Tunisia, Senegal and Mauritania throughout the months of September, October and December 2018. NEF Africa Science Week are led by NEF Ambassadors, local science and technology champions, together with support of local academic, public and private sector stakeholders and sponsors, who organize three to seven days of events in their countries to promote Science, Technology, Engineering and Mathematics (STEM). STEM boot-camp workshop for students from 20 selected secondary schools. Women in Science talk -show/ Cocktail Award Night focused on Nigerian women who have made significant strides in science and technology pursuits in Nigeria. STEM road show which will involve interactive stands and displays from industry partners who will provide sessions for students to learn the scientific basis undergirding their products and innovations. The STEM road shows are designed to take place in rural areas of the country. Science expo where at least twenty companies will be invited to showcase various products and processes tailored towards secondary school students. 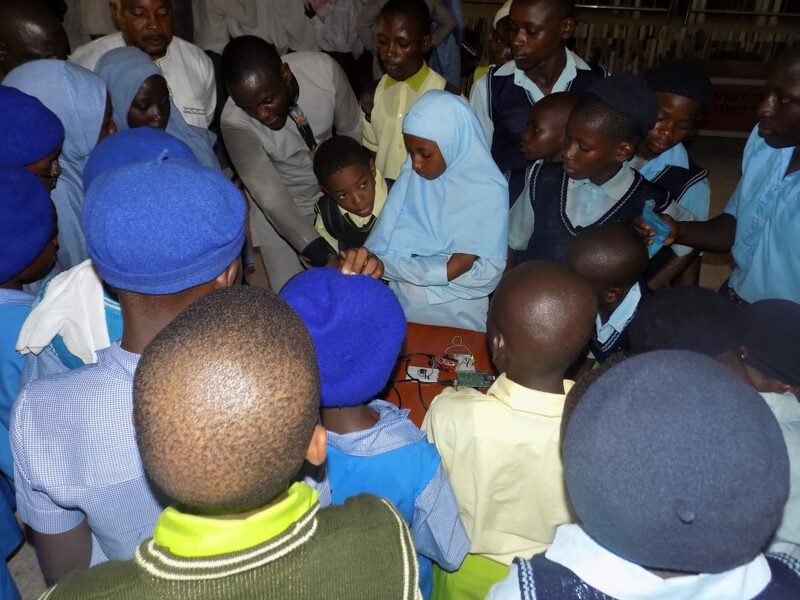 WAAW Foundation collaborated to facilitate STEM and computer programming sessions at the Next Einstein Forum’s Africa Science Week 2018 at Abuja Nigeria. 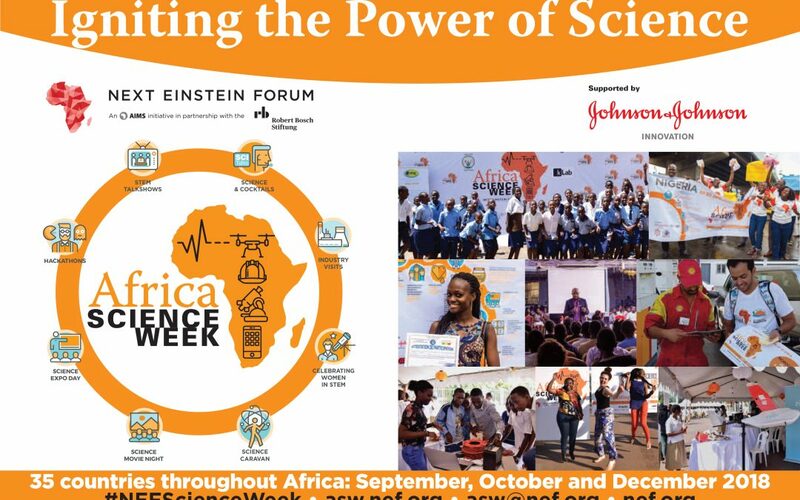 In accordance with the goals of the 2018 African Science week across 35 African countries; the program is designed to provide an opportunity for citizens to engage in everyday science, instil a curiosity of learning and interest in Science, Technology, Engineering and Mathematics (STEM) pursuits among the public and allows young Africans, especially women and girls, to become excellent scientists and technologists. 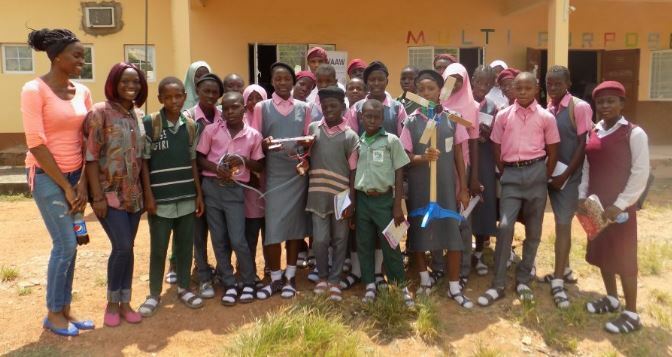 During the STEM boot-camp workshop, WAAW Foundation was paired with secondary school students from Abuja to explore and experience some science and computer programming experiential learning process. 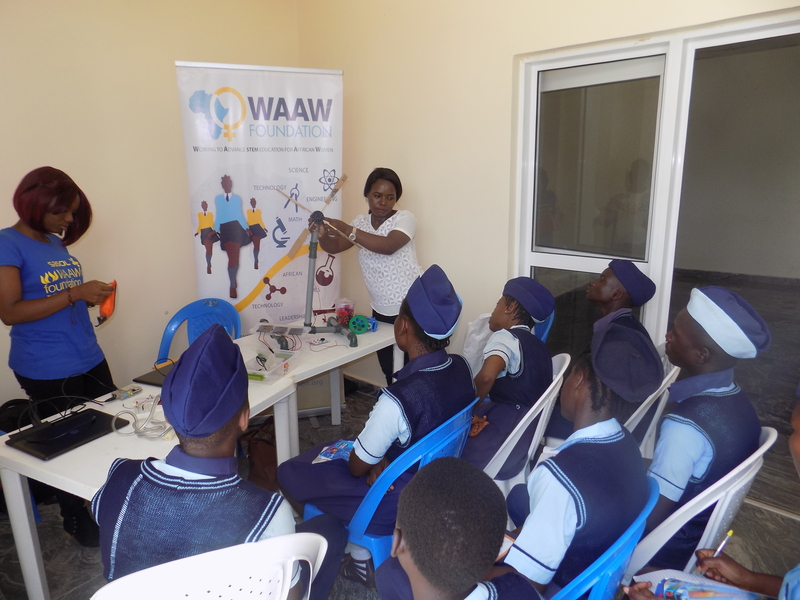 At WAAW Foundation, our focus was demonstrating STEM hands-on projects relating to their school science subjects using locally available materials such as water, salt, balloon, battery, papers, wires etc. to create and instil innovative skills among secondary school students and to create a truly meaningful and sustainable program that encourages entry and retention in STEM fields especially for girls. On October 24 2018, WAAW Foundation facilitated a session a STEM boot-camp workshop for secondary students hosted at African University of Science and Technology (AUST) Abuja, Nigeria. We had sessions with group of students on Renewable energy and Arduino Programming. The renewable energy session was facilitated by Lucy Ikpesu Ewhubare – WAAW STEM Trainer; this session was on generating electricity from the Solar and wind energy (wind turbine). Students were made to work with the Solar energy kit given. They explored as they experiment on the Series and Parallel connections using the terminals of the solar panels and the amount of voltage generated was measured with the multimeter. At the end of the solar energy session, students were able to generate electricity that could light a LED bulb, pump water using the pressure pump and charge a phone. 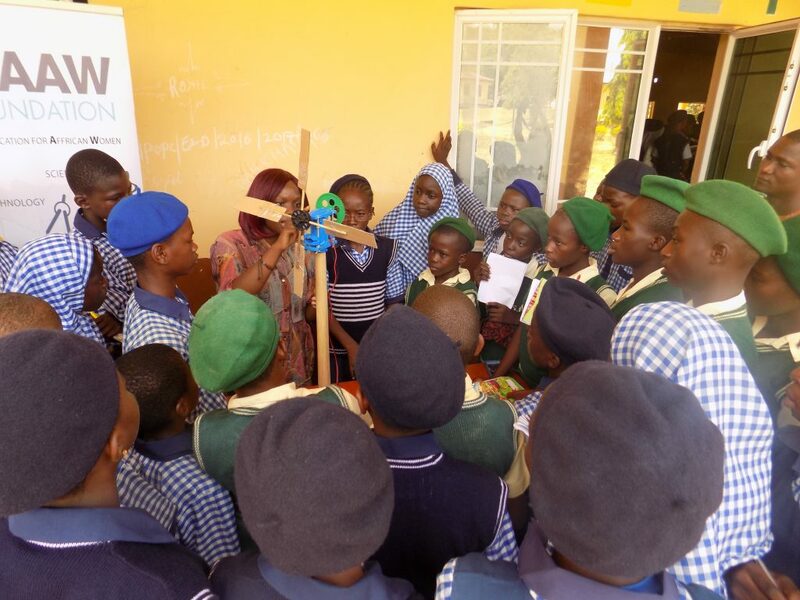 The wind turbine was also used to generate electricity using a locally constructed wind turbine which was recently re-engineered by our STEM Trainer – Lucy Ikpesu Ewhubare made with PVC pipes and materials such as wooden stick and cardboard (carton); this also powered a LED bulb. The computer programming session was facilitated by Miriam Aboh – an Alunmi WAAW chapter fellow. She introduced the students to Arduino, a fun and innovative approach for programming Microcontrollers. With the Arduino board and other hardwares, a traffic light and a push button LED circuit was built as a mini project displayed to the students. On October 25 2018 was the Women in Science talk -show/ Cocktail Award Night focused on Nigerian women who have made significant strides in science and technology pursuits in Nigeria. 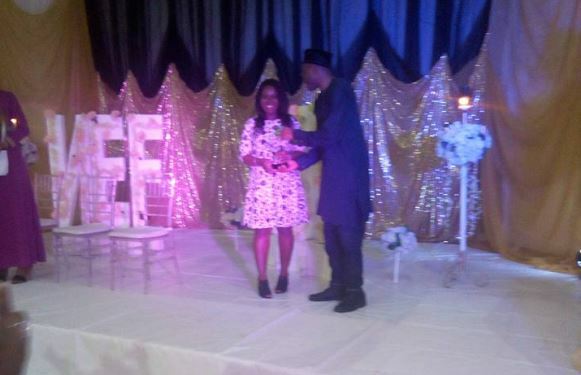 During this event, Our STEM Trainer – Lucy Ikpesu Ewhubare was awarded as Nigerian Young Women In Science – Recognition In promoting STEM in Nigeria. On October 26 2018 was the STEM road-show which will involve interactive stands and displays from industry partners who will provide sessions for students to learn the scientific basis undergirding their products and innovations. The STEM road shows are designed to take place in rural areas in Abuja Nigeria. WAAW Foundation facilitated at the STEM road show held at Government Secondary School, Gwagwalada Abuja on STEM and computer programming. The renewable energy session was facilitated by Miriam Aboh on generating electricity from the Solar and wind energy (wind turbine). Students were made to work with the STEM kit and the ends were able to generate electricity that could light a LED bulb, pump water using the pressure pump and charge a phone. The computer programming session was facilitated by Michael Omimi on Arduino programming, a fun and innovative approach for programming Microcontrollers which was used to design a mini project on traffic light and a push button LED circuit. The students are very excited to learn as we took them through Science in a Fun and practical way how they could immediately related every session to everyday life, have seen possibilities to use those knowledge to solve real life issues.